« Day 171 – Myriam G.
Day 172 – Sandra T.
Versión en español sigue abajo. Good morning and welcome to the Worldwide Day of Giving!!! Today is a day that you can do what I have been doing for 182 days (I am behind on posting my blogs). It’s so simple…find someone you don’t know, tell them you are participating in the Worldwide Day of Giving and give them $10, or whatever you can afford, no strings attached and find out what they will do with the $10. Hopefully you can learn a little bit about them as well. I always get their contact information and then try to stay in touch. Have fun with it! Then I hope you will share your stories here…if you take pictures or video, you can post your stories on the Facebook Page. I have a couple of media interviews today. This morning I am heading over to News Channel 8’s Let’s Talk Live for an interview with Natasha Barrett and Melanie Hastings. Then around 2:30 I will be on CNN with Ali Velshi. Finally this evening, I will be celebrating here in DC at Café Dupont (The Dupont Hotel) from 6-8pm. If you are around, please join us! 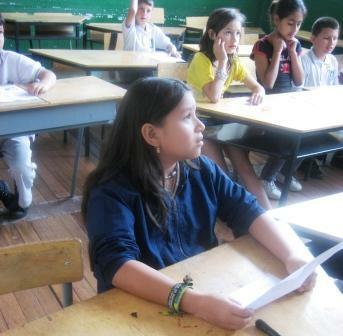 On day 172 I found myself at the Instituto Tecnico Marco Fidel Suarez (ITMFS), a grade school in Manizales. The kids here are similar to the those at the San Agustin school. They come from very simple backgrounds. Poverty is rampant and sometimes the brightest part of their day is the time they spend at school. “Sometimes the meal they get here might be the only meal they get all day,” says Sandra, and English teacher at the school. The bilingual chorus that I was working with at this school was made up of Sandra’s students. After we were done rehearsing with the students, Sandra stayed to talk to me some and I found my recipient for my 20,000 pesos. 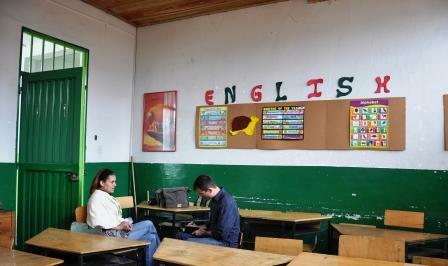 Colombia divides it’s neighborhoods into socio-economic categories called strata. The wealthiest is six and the poorest is zero. This school has children from the zero and one strata. To me the concept was unfamiliar to identify people so readily by a stratum based upon where they lived, but here it was quite common. In fact, many of the students that I met would ask me which stratum I belonged to. A question that I didn’t know how to answer but comparatively speaking, it was surely much higher. I learned that English is not the only thing that Sandra is passionate about. Now the proud mother really came out and she flipped through her phone for a second and handed it to me. “I have the most special baby boy: Juan Felipe.” He is three and looked so happy in the photos she shared. I shot a little video of the class singing as well as Sandra explaining what she was going to do with the $10 and why. This one is in English. Enjoy. En el día 172 estuve en el Instituto Técnico Marco Fidel Suárez (ITMFS), una escuela del sector público en Manizales. Los niños de acá son parecidos a los del Colegio San Agustín. Tienen un historial muy simple en donde la pobreza es excesiva y algunas veces, la mejor parte del día es el tiempo que están en la escuela. “Algunas veces la única comida que tienen es la que comen aquí” dice Sandra, la docente de inglés. El coro bilingüe lo integran los alumnos que asisten a clase con Sandra. Después de haber terminado el ensayo con los estudiantes, me quedo con Sandra para hablar un poco y encuentro a quien darle mis 20,000 pesos. En Colombia los barrios se clasifican en categorías socio-económicas llamadas estratos. El estrato más rico es el seis y el más pobre es el cero. Los estudiantes de esta escuela provienen de estratos cero y uno. Para mí el concepto no era familiar, es decir, identificar a las personas rápidamente sólo con base en el lugar donde viven; pero aquí en Colombia es algo demasiado común. De hecho, muchos de los estudiantes que conocí, me preguntaron a qué estrato pertenecía. Una pregunta que no supe cómo responder, pero comparativamente hablando, de seguro mucho más alto. Sandra es apasionada con respecto a su trabajo, habla en inglés todo el tiempo y espera que sus estudiantes hagan su mayor esfuerzo. Muchos de los estudiantes son afortunados al conocer algunas palabras en inglés. Se espera que aprendiendo las canciones que les enseñamos, los estudiantes hagan una conexión y aprendan más rápidamente. Había una estudiante en el ensayo del coro, quien estaba muy avanzada con respecto a los otros; creo que tiene una extraordinaria habilidad innata para los idiomas. Con el tono de voz de una madre orgullosa Sandra mueve su cabeza y dice: “Sí, es muy buena para el inglés”. Aprendí que no sólo el inglés es lo que apasiona a Sandra. Aparece una madre orgullosa quien saca su teléfono celular, busca por un momento y me muestra una foto: ¨Tengo el bebé más especial: Juan Felipe.” Tiene tres años y se ve muy feliz en las fotos. Grabé un corto video (encima) en donde aparece el ensayo del coro y Sandra explicando qué va a hacer con los $10 y por qué. Está en inglés. Disfrútenlo. Este blog fue traducido generosamente por Sandra Toro en Manizales, Colombia. IT would be really kool to send the school some candy for her class and some Americanized stuff. When I went to Chile in Middle School we took candy and american flag pencils. The kids thought it was gold. Do you have info on how to get in touch with her? I just saw your interview on CNN! I think what you are doing is absolutely amazing and inspiring! Hey, I like what you’re doing. However, have you thought about expanding it past money? Sure 10 bucks can make a difference, but what about other things? Maybe 10 bucks worth of work? Helping to carry someone’s things to their car? I try to go out of my way to help people. I’m always the guy that stops to give a guy walking a ride, or check on someone with their hood up. It has certainly afforded me some wonderful conversation. I also help out monetarily when possible. I was in the Marine Corps and a guy helped me to go home for christmas to see my family, he paid for my gas from California to Louisiana on the condition that when I see a person in need that I pay it forward. Since then I have made it a point to help someone in whatever way possible on the same condition. Like what you’re doing. Willing to help you expand the concept too. If you’d like me to keep you updated on helping people out… just shoot me an e-mail. Reed- Awesome job! I have re-posted your blog to my over 7K plus FB friends and colleagues. I am also making your Worldwide Day of Giving the message for the month in my E-zine going out today to my subscribers. With my $10, I stopped by a Jamba Juice, walked up to the counter, dropped the $10 in the tip jar and left without ordering anything. The teenagers all had grins on from ear to ear. It was so easy to find someone to give money to-they used it for lunch! So many people, so little money to go around. Many are helping in other ways, and that is great too! Keep going!